Shelkar Dorje Tso (Tib. ཤེལ་དཀར་རྡོ་རྗེ་མཚོ་, Wyl. shel dkar rdo rje mtsho), aka Shiwa Dorje Tso (Tib. ཞི་བ་རྡོ་རྗེ་མཚོ་, Wyl. 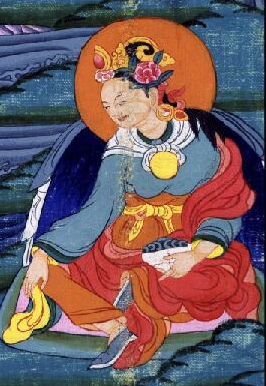 zhi ba rdo rje mtsho), was one of Guru Rinpoche's consorts. According to Tulku Thondup, she crossed the Tsangpo river standing on a bamboo walking stick. She is counted among the previous incarnations of Sera Khandro and Khandro Tsering Chödrön. In Pema Lingpa's Lama Jewel Ocean (Wyl. bla ma nor bu rgya mtsho)  collection there is an account of Namkhé Nyingpo meeting Dorje Tso as a result of a prophecy, taking her from her homeland in Shang Tanak, introducing her to the practice of Yangdak Heruka and offering her to Guru Rinpoche as a consort before she eventually attains realization through the practice of Yangdak and is able to fly through the sky. ↑ Masters of Meditation and Miracles, p. 92. This page was last edited on 12 February 2018, at 21:09.